After 15 years at the Orange County Register, reporter Teri Sforza's latest title is "The Watchdog." Her primary job is to write pugnacious, saucy items for a blog focusing on malfeasance by trusted figures – particularly when tax dollars are involved. It's part of the newspaper's reinvigorated focus on watchdog reporting. Q. So what led the Register to put such a focus on watchdog reporting? Sforza: Quite honestly, I think it's a simple, raw desire for survival. What does a regional paper like the Register have to offer that the Los Angeles Times, New York Times and Washington Post can't? Local news, of course. But what kind of local news? For some time, the emphasis was heavy on reflecting the lives of ordinary readers, as opposed to follow-the-money, turn-over-the-rocks, poke-around-in-the-dirt reporting. But if looking under rocks fell out of fashion a bit, the rise of the Internet has helped it stage a comeback. Our ability to monitor Web site traffic has made it easy to see exactly what people are actually reading, and it turns out they're hungry for very traditional watchdog-type journalism - stories that keep a critical eye on government spending and the public trust. Q. What's your job like? Sforza: The joy of my job is that I get to turn over lots of little rocks that haven't been disturbed for a long time. If ever. Lots of worms under those little rocks, sometimes. So what exactly do I do? I am Paper Girl. I collect very simple and basic public documents from cities, special districts, schools, the Nuclear Regulatory Commission (we have San Onofre Nuclear Generating Station here) and nonprofits - stuff like contracts, tax returns, audits, expense reports, financial disclosure forms, inspection reports - and I write a story about what I find five or six days a week. Like how the animals euthanized at the local animal shelter end up in protein meal that's sold to aquaculture operations in Asia. And how the Boy Scouts of America National Council pays one of its leaders $888,000 a year. And how a local water district owns $1 billion in securities. And how the nuclear power plant has serious problems with human performance error. 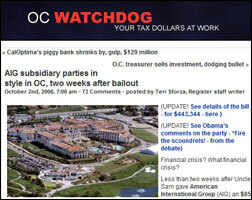 And my biggest (and only) national scoop yet – AIG's $443,334 post-bailout bash at the St. Regis Monarch Beach Resort. Q. And how did you find yourself in this position? Sforza: I have been bellyaching about the need to do more of this type of reporting for years. Our investigations editor, Chris Knap, started "Watchdog 101" classes to help train younger reporters, and our watchdog reporting really picked up. But most people covering three sprawling cities just don't have the time to do as much of this type of reporting as they'd like. And then Michelle Nicolosi came to visit. Nicolosi runs the Seattle Post-Intelligencer Web site, seattlepi.com, but she was once just my colleague here at the Reg, the wild and crazy medical reporter with the awesomely loud laugh. She was a key member of the team that won the Reg's Pulitzer for investigative reporting (for uncovering fertility fraud at UC Irvine), so she has solid street cred in reporterland. Anyway, Michelle gave a terrifying Armageddon-type presentation to the Reg staff, telling us that if we didn't figure out how to work on the Internet, the industry was doomed, journalism was doomed, we were all doomed. A lot of people were pissed off. I was profoundly disturbed. It was stuff that you'd heard many times before - but she made it really scary. Two days later, I was still hearing the hellfire and brimstone as I awoke. I opened my eyes and -- this sounds utterly ridiculous, but it's true - uttered the words, "Your Tax Dollars at Work." Of course! Instead of complaining about there not being enough watchdog reporting, I'd simply do it myself. So I wrote a proposal and it went to the mucky-mucks and we agonized a bit over neutrality and tone and, well, here we are, nearly five months later, and I stick my fingers in someone's eyes just about every day. I produce 24 or so stories a month, and OC Watchdog is getting about 70,000 to 80,000 page views a month. When you consider that I only work 24 hours a week (well, I'm only paid for 24 hours a week), that's pretty good, and proves the original premise: People are hungry for this kind of reporting. We need to do so much more of this if we are to survive. I'm optimistic that the mucky-mucks see that, too. Q. Those sound like great stories you are digging up. Do they also get into the paper? Sforza: Every Saturday, I get a column on b-2, where I put the week's greatest hits, greatly condensed. And another item or two will get picked up for the daily paper for print. But the print folks want the copy to go through the neutralizer, which is a lot of added work for everyone. I get to write with a lot more attitude on the web, but that gets sucked out for print. This could be where you say, "No wonder newspapers are dying!" Q. No wonder newspapers are dying. Do you think this is something other local and regional newspapers could do? Sforza: Only if they have local governments! Of course, they should and they must. We've got to really earn our keep as the eyes and ears of the people if we're going to survive. Has anyone started to connect the Dots on the Sir Stanford Fraud? Why is the Media downplaying the "British Royal" connection? Antigua is the British Royal's playground. Stanford by having a Knighthood, probably obtained it through his activities in Antigua. He may have even laundered money for the British Royals or his Texas Buddies, the Bush family. Does Sir Stanford have a CIA connection? There is a global interest in the fraud and book sales would be global. The money trail reveals everything.